Your home is meant to be enjoyed — after all, it’s your personal and most private sanctuary. As you know, however, there’s always outside work necessary to make that enjoyment possible. Since the roof is one of the biggest and most important parts of your exterior, it’s one place you should be checking on at least once a month to head off expensive repairs. Document everything. Take photos of your roofing system each month, this will help you notice any changes immediately. Look out for structural deformations, missing shingles or damaged gutters. Keep in mind that any problem should be fixed right away. It’s also crucial to have up-to-date records of your entire system, including a detailed history of installation, design and other specifications, like the products and materials used. It’s also helpful to include details on any repairs or changes made during the period. Clean out debris. Fallen leaves, twigs, dirt and other debris can block the flow of water from your roof to the gutters. When this happens, water may overflow to your siding and can cause damage to your walls, flooring, ceiling and even your landscaping. In extreme cases, the roof may also collapse due to the amount of water that has accumulated in the system. 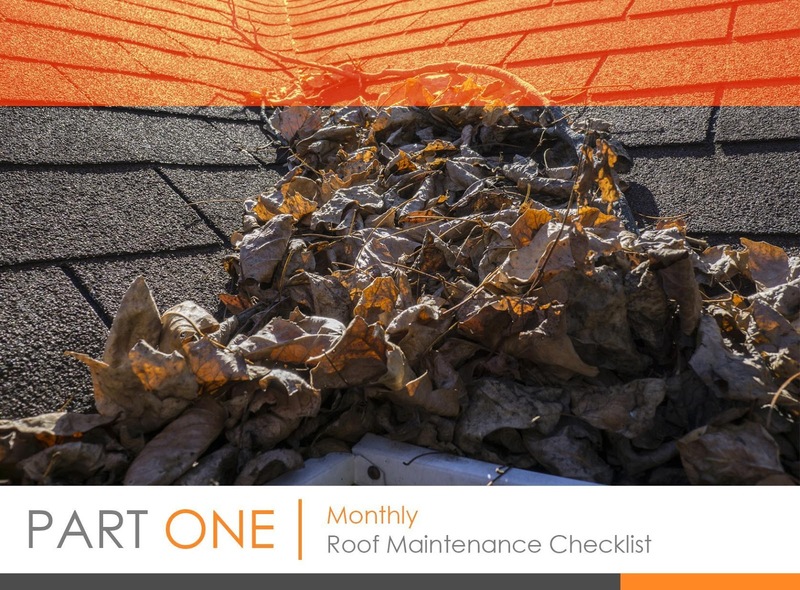 Cleaning out debris monthly is an efficient way to keep your roof and entire home in top shape. Be mindful of roof traffic. Too much roof traffic can pose a threat to the integrity of your roofing system. Be sure to observe how many people are walking on your roof and how often the roof needs to support the traffic, for instance, when doing HVAC repairs and window maintenance. Perform a monthly walk-thru and note where heavy traffic is expected, you may want to consider adding extra protection to these areas. Take a look inside. Some roofing issues are first noticed inside a home, especially if you’ve not been doing regular inspections. Do a visual check on your walls, ceilings and attic, and note any irregularities that may indicate a roof damage. Seasonal roof inspections are just as important as monthly inspections. In the second part of this three-part blog, we’ll list down some of things you can do to keep your roof in tiptop condition throughout any season. Stay tuned!